A pediatric chiropractor helps babies and children to reach their full genetic potential by removing nervous system interference. Through a gentle chiropractic adjustment, their bodies have the opportunity for optimal development with a robust immune system and a minimum of health-related issues. One of our patients brought in his 10-year-old daughter to see us. She was frequently sick with infections, colds or flu, to the point where she was absent close to 15 days of school each year. We evaluated her, and she began to receive pediatric chiropractic care. In the past year, this young lady had almost a perfect attendance record at school with only one day of absence. She boosted her immune system through natural chiropractic care. No drugs or antibiotics were needed to achieve this state of optimized health. 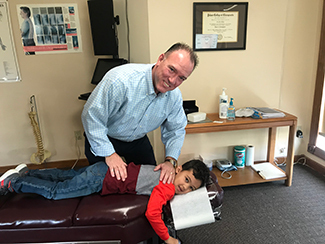 We often ask our patients, “Why are you leaving your kids at home to eventually develop the same problems that you have?” We say it with a smile, but we’re passionate about the benefits that children receive when they grow up under chiropractic care. Because their bodies are young, they make the best patients; they respond quickly and often dramatically to a gentle adjustment! Contact our Wexford office today, and let’s get your child off to a good start in life.